Fiberglass Storage Tanks are a robust liquid storage option for agricultural facilities, commercial properties and areas with limited water supply. They can be used to store water for fire suppression sprinklers or be used to supply extra water for firefighters. Fiberglass storage tanks meet AWWA and NFPA 22 requirements for private fire protection, making them an excellent option for fire water storage. 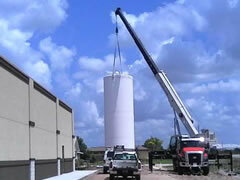 Fiberglass tanks are also designed to meet or exceed ASTM requirements. Also known as fiberglass-reinforced plastic tanks or FRP tanks, these water storage tanks provide one of the strongest available liquid storage solutions. 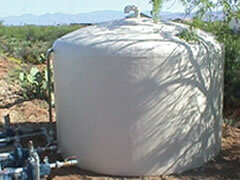 Fiberglass tanks are popular due to their corrosion resistance and ability to withstand extreme weather. 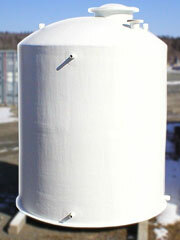 All GEI Works' fiberglass tanks are made in the USA. Standard fiberglass water tanks are highly durable and built for safe liquid storage around homes, business and industrial facilities. Fiberglass storage tanks can be constructed to accommodate a variety of liquids and be shaped into many different configurations. 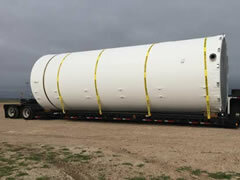 Fiberglass tank options include large vertical and horizontal tanks, chop-hoop filament wound fiberglass tanks, and centrifugally cast fiberglass tanks in a variety of sizes and styles. Sectionalized fiberglass tanks are an excellent option for retrofit domestic fire protection systems. Tanks include assembly instructions and adhesives for easy on-site installation. Sectionalized tanks are not recommended for the storage of aggressive chemicals or food grade liquids; however they are widely used as fire protection tanks.